ptr branch v3.1.11.3 dol reopened..
lambent checked, turgin's respite, lower lambent glitchy? 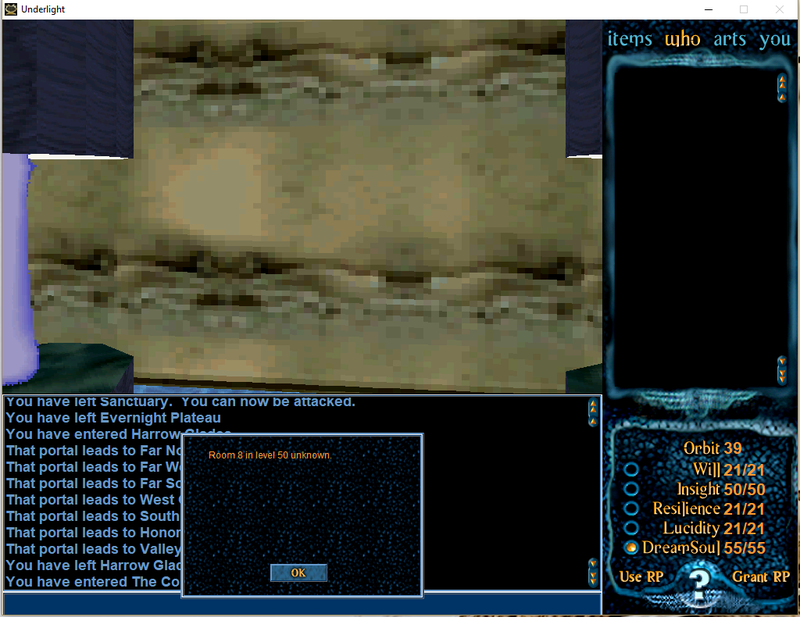 chasm, shrine of lucidty..checked missing portal out autotele? !! basin of stars - chak n flask .. !! crash no error !! - Textures.rlm: Re-compiled and needs testing. Please check as many levels/rooms as you can. Things to look out for, crashing, missing textures, see-through walls, black walls, white walls, strange sky textured walls. I went through and checked as many levels / rooms as I could. Now I need the communities' help to assist further! Visit your favorite places and make sure they look as they do on production side! --- Oh, be sure to do a forum post stating where you visited so we can check it off the list and so no one else checks the same areas twice! Oh! Good catch on the Chak n Flask, i'll look into that one. - Chak n Flask issue resolved. !!! conclave The labatory, pad between beams. ERROR Room 8 in level 50 unknown. !!!! deserted garrison uninitiated - checked right clicking portal does nothing. !minor - heading from lichen lodge through portal to pebble path road, upper umbric. go straight forward. wierd graphics glitch temporarily as if slipping out of map. few other places do this! !minor - pebble path road to floating rock road, head straight forward through portal, keep walking forward minor graphics glitch.! I'm looking for more information on how you are able to replicate this. I tried standing on this pad on both production and ptr, neither attempting to trigger or trip does any action. I am curious to know how you got the "ERROR Room 8 in level 50 unknown" error to happen. I have also seen this error in the Conclave, but it was inside the "Spy Glass". Let me see if I can get the same error again now since that was a long while ago that I witnessed it. Ask me anything! I'm here to help you. Does this happen on the production / live server as well? Yes. The live server is where I get that error. I will admit I have never used the test server. I should look into that. Thanks for this info Fancypearl & Kanin! This tells me that it is a separate issue and not related to the 3.1.11.3 patch. I'll get this into it's own issue ticket. if it helps I could probably record it. No need! --- The thought is much appreciated though! Also created an issue ticket for this.